Scientists say the earth has entered a new geological epoch: The Anthropocene. 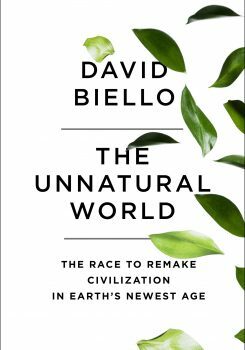 Author David Biello on what humans will have to do to make the planet endure. The following is an excerpt from The Unnatural World: The Race to Remake Civilization in Earth’s Newest Age, by David Biello. The view from space changes people. Just before Christmas 1968, William “Bill” Anders and two other men spun around the moon in the prosaically named Lunar Module, travelers on a course as far from Earth as any human has ever been. Apollo 8 launched from Cape Canaveral on the morning of December 21. As Anders, Commander Frank Borman, and Module Pilot James Lovell blasted through and beyond the atmosphere, Earth dwindled from planet-size to basketball-size. The astronauts busied themselves with the flight checklist. By the time eleven hours had passed, the planet appeared no bigger than a baseball, and within three days the astronauts had floated all the way to the moon. At precisely the moment NASA planners had predicted, this lonely manned module in the vastness of space lost radio contact. The astronauts passed behind the moon, and the entire Earth disappeared. The men circled our planet’s steadfast companion three times, diligently recording its pockmarked, colorless surface, littered with the blast craters and detritus of bombarding asteroids. From roughly 100 kilometers up, the moon didn’t look like much. It reminded Anders of “a deserted beach that had been churned by footprints during a volleyball game” or, as he put it later in the flight, “beach sand darkened by the cold embers of bonfires,” which earned him hate mail from poets. Then, on their fourth orbit, a revelation. Before the Apollo 8 astronauts’ eyes, home slid out from behind the horizon—small enough to be blotted out by a thumb. “Oh my God! Look at that picture over there!” Anders cried out. What he caught glimpse of, as Borman later described, was simply “the most beautiful, heart-catching sight” of their lives, “one that sent a torrent of nostalgia, of sheer homesickness, surging through” them. Anders raised his camera—over the protest of Borman, who fretted about taking an unscheduled photo—and snapped the picture that would make this mission famous and change the human perspective on the world forever. As the British physicist Fred Hoyle predicted back in 1950, a picture that revealed the whole Earth shining in the empty darkness of space would unleash “a new idea as powerful as any in history.” That idea is now known as the Anthropocene, the notion that humanity has become a world-changing force of nature. That Earth is in the grip of human nature. Most of us have never been to space and, despite the best efforts of industrialists and dreamers like Elon Musk, most of us never will. The closest I’ve come is on flights across continents, looking over green irrigation circles blooming in the desert or the snowy wastes that edge the Arctic. But anyone with an Internet connection can now enjoy NASA pictures and Google Earth views. Only twenty-four men have left Earth’s orbit, but satellites have made millions of us voyeurs of the planet. Like a blue-and-white jewel set in the firmament, Earth gleams in the inky darkness of space—our only home. Just as looking in the mirror can reveal our own flaws and strengths, looking back at the planet provided a fresh perspective. We humans are fragile animals, like most life on Earth larger than a single cell. We are trapped, utterly reliant on our spaceshipplanet; without it death creeps in from the cold, indifferent void. Even so, it may not be space that kills us in the end, though there’s always the chance of another obliterating asteroid like the one that ended the reign of the dinosaurs. Instead, like the Soviet dog Laika, the first animal to orbit Earth, we may simply find ourselves on a spaceship that can no longer support us. When NASA released Earthrise in 1968, someone had reoriented the image to make it appear as if Earth rose over the horizon of the moon, as the moon and sun commonly rise over the horizon when viewed from Earth. But that is not how it works in lunar orbit. Earth actually snuck around the left side of the moon, as viewed from the orbiting spaceship, and the astronauts saw the lunar horizon as a vertical fact and Earth just hovering in the void. Humanity often seems to be in the habit of such misperceiving, changing the picture to suit our preconceptions. The close view is that Earth is simply the ground beneath our feet (though it is mostly water). Back on Earth, 1968 saw riots, protests, even war, as well as assassinations. Martin Luther King Jr. and Robert F. Kennedy died and Soviet tanks crushed the Prague Spring. At the same time, massive dams captured the flow of rivers from British Columbia to Nigeria. Luis Alvarez, who helped build the first nuclear weapon, won the Nobel Prize for his work in particle physics, and France tested its first atom bomb. Charlton Heston damned us as fools at the end of Planet of the Apes for the use of such weapons of apocalypse and Saddam Hussein seized power in Iraq. A military dictatorship took firmer control of Brazil, launching a wave of deforestation that would soon be visible from space. By 1968, a new era in the history of the planet was also well under way—the Anthropocene, a union of what was once considered, perhaps foolishly, solely human and solely nature. This new epoch remains ill defined. It may be a scant 250 years old, dating to James Watt’s invention of a practical coal-burning steam engine. Or it could be as much as 50,000 years old, when humans began killing off other large animals in earnest, starting with our fellow hominids, the Neanderthals. Humans really got good at leaving our mark in the 1940s with the invention of nuclear bombs, which spread a unique human signature of rare elements like plutonium across the globe and marked the beginning of an ability to be the destroyer of worlds. Still, whatever date is chosen, it’s a rounding error in the 4.5-billion-year history of this planet. Through ingenuity and technology, Homo sapiens has become the dominant species on the planet. From deep beneath the ground, where we busily hollow out yawning cavities in pursuit of fossil fuels, to the skies, where carbon dioxide molecules released by our incessant burning will trap heat for longer than our species has walked the planet, we now drive the processes some still like to think of as nature. And just as a climate shift marked the turning point in the two most recent epochs—the cold, wintry Pleistocene to the long summer of the Holocene when civilization was born and flourished—so too our human-made climate change merits a new epochal designation. The marks we have made are deep and pervasive. Humanity is writing a new chapter in Earth’s history, and it may not remain a rounding error for long. Our mark lies in the rock being formed beneath our feet, in the chemistry of the oceans, in the composition of the air we breathe, even in the very evolution of life itself. Agriculture, cities, and sprawl drive the sixth or maybe seventh mass extinction in the planet’s history. The choices made this century will help set the course of the entire planet for at least tens of thousands of years. If people, plants, and animals don’t like the climate of 2100, 2500, or perhaps even 25000, they will have us to blame. And if human civilization is to persist to see that climate, we need to get busy inventing a better future. We have rules and religions to prevent murder, but far too few moral codes or stories to guide us as we attempt to survive and thrive on this planet for millennia more. “We” is not the perfect pronoun for all this, of course. Not all of us have benefited from this world-changing transformation, or at least not equally. The luckiest few have grown fat as the primary beneficiaries of the environmentalist’s paradox, which, put most simply, is: If the world is going to hell, why are so many people better off than at any other point in history? The middle-class “we” is now more than a billion strong—and growing. We have created technologies and systems that any individual can barely see let alone comprehend, many of which continue the seemingly implacable work of uprooting forests, besmirching the skies, and befouling the seas, with results that are all too visible. As a result, a creeping sense of doom and impotence pervades many of the minds of the best-off people of all time. Meanwhile, the richest among us, the almost all-male cohort who put the anthropos in Anthropocene, who mostly grew wealthy through uninhibited exploitation of the riches of this Earth, avoid the most numerous victims of this pollution, most of whom live in the future. But people are also the first life to transform this planet with the possibility of consciously recognizing that world changing. Civilization has terraformed Terra herself, mostly unwittingly, just like the cyanobacteria that laced the planet’s skies with oxygen long before us. Those unconscious life-forms evolved better ways to organize—plankton, kelp, ferns, trees—systems that last to this day. We call our evolved organizational structures farms, houses, and cities, but we also don’t pollute only with one gas. We don’t have to hit the world like an asteroid, wreaking blind havoc as we have too often done to date. We can be a force for good. We still have a choice—and time to make it. Mother Nature seems to be losing the battle to live with her most innovative child. It’s now up to us to grow up and control ourselves, recognize that we set the terms under which the rest of life on Earth thrives or dies. Were we to perish like the dinosaurs, only those animals and plants that survived our current reign of malign neglect would be around to fill the ecological niches left empty by our depredations. And it’s not just biology. Human dams hold back five times more water than flows through all the rivers and streams on all the continents. Human-made canals function as new rivers while natural rivers are channelized into canals. Reefs and atolls become full-fledged islands with sand imported from elsewhere or sucked up from the seafloor. Some 500 million metric tons of aluminum have been pulled from Earth’s crust—enough to cover the United States in foil—and used to make everything from airplanes to beer cans. We have even made 6 billion metric tons of plastic, enough to cover the whole world in a thin film, in just the last fifty years or so. These are no minor perturbations. We have a global influence without any sense of global responsibility, a kind of haphazard world-changing impact, self-assembled from the activities of 7 billion–plus individuals trying to build a decent life, and a better life for their descendants. As the crew of Apollo 8 showed, we will leave our mark on the universe too, radio and television signals propagating into the void along with spacecraft, potentially bearing stowaway microbes to seed new life. If the Curiosity rover on Mars strikes water, Earth microbes contaminating its instruments may find a new home. We have even begun to litter nearby planets—as well as Earth’s orbit—with space junk. The astronauts who landed on the moon after Anders and his colleagues showed the way left an enduring legacy: trash—ranging from bodily waste to golf clubs. Will anyone go back and pick them up? The Anthropocene no longer needs humanity to make its mark, though we make that mark more indelible with each passing day. This new age is not just climate change, it is everything change: the sky, the sea, the land, the rocks, life itself. Even if humanity were whisked away tomorrow in some kind of rapture, these changes would continue to propagate through time. If we want to ensure that this epoch is more than a blip in the history of the planet, it will take all of our smarts, sociability, and technology to begin to stop hindering the functioning of formerly self-propelled systems and perhaps improve them, such as balancing the flow of carbon into and out of the atmosphere. As you will read in the following pages, that work has already begun. Starting with the changes wrought in the global ocean and traveling underground, over land, into the sky, and finally back into space on potential journeys even farther than Apollo 8, I will introduce you to some of the men and women attempting to wrestle with our outsized role on the planet and what might be done to ensure that this human era endures. I will argue that we must accept the responsibility that comes with the power that humanity now possesses. We must begin to manage the planet, slowly, carefully, with room for both error and improvement, but inexorably. This is not a settled debate. No one, least of all me, can yet say what the correct role for humanity is in this novel age. But it is certainly not preserving Nature with a capital N, somehow separate from humanity, or bringing stasis to what is and always has been the dynamic flux of life, chemistry, and plate tectonics. This is about managing change, adapting to it, and increasing the resilience of our civilization at the same time as we make more room for our fellow travelers on this life-bearing spaceship. Human life in this new era is fraught with anxiety. Are there too many of us? Is the food we eat destroying us and the planet? Is our very own technology transforming us into mindless, atomized automatons? And what exactly is the impact of all that technology on the planet itself, like the jet contrails that scar the sky day after day? In the competitive thrust of modern life, what is lost? To me, the most important question is: Are we even ready to attempt to manage the planet better? The stakes could not be higher. As the astronomer Carl Sagan famously noted, everyone who has ever lived, all the knowledge ever known, everything anyone has ever loved lives only on this incredibly small planet in the vastness of space. We are now stewards. As the psalm goes: “The highest heavens belong to the Lord, but the Earth he has given to mankind.” That stewardship may derive from the sty and the ward, as in warden of the pigsty—a messy, ravaged environment, full of muck, microbes, and only two kinds of megafauna: us and the pigs we raise to eat. Or we can be the kind of stewards that derive from the Old English word stig—house—full of many interlocking parts and functions that must be coordinated. We can make Earth a true home, the same kind of home we have shared with other animals and plants for the last 200,000 years—or an even better one. What we stand to gain is nothing less than an enduring civilization and a firmer understanding of our planet and ourselves. We have arrived at a new geologic epoch of our own making. This can be very bad or even good. The choices made by our growing human family will determine that future. Only one thing is for sure: You can enter the Anthropocene any time you like, but you can never leave. I argue the goal therefore must be to make an enduring Anthropocene, an epoch that, in geologic and civilizational terms, stretches into an era. This epoch could herald a new age of human adaptation, the greatest strength of a species that has shown an ability to thrive almost anywhere on the face of this planet. This is a hard story to tell because it has no definitive beginning or end, and I could have gone anywhere, seen anything to tell it. We are all lost in the middle of it. That’s why I started with the moment when we first got a more holistic glimpse of the problem from space, though the problem starts within each and every one of us. That’s also why I’ll start this journey of discovery in the largest realm of this planet, a place that seems beyond human control, or even, it sometimes seems, understanding: the oceans that cover more than 70 percent of the globe. Our impact on the ocean will prove that the Anthropocene is now, as well as what this epoch might look like. We live these days on a science fiction planet. I will then proceed to lay out the case for this new geologic epoch as it is written in stone. This epoch’s existence argued for, I’ll move on to examine other ways—what mix of plants and animals, wildlands and cities cover the surface of Earth—that will provide a metric for the job we will do as a world-changing species. Finally, I will turn to the future, and how to make a better one, or at least a less destructive path on which to muddle through the next century and beyond. Now our every action has an impact, whether swaths of land sacrificed to produce energy or the encroaching fields of agriculture burning down rainforest remnants. What we lack currently is control, of both ourselves and the planetary systems we change in ignorance. This is not the end of the world. This is just the end of the world as we have known it. Adapted from THE UNNATURAL WORLD by David Biello, Copyright © 2016 by David Beillo. Reprinted by permission of Scribner, a division of Simon & Schuster, Inc.
David Biello is environment and energy editor at Scientific American in New York, New York. It has been suggested – 100 years after the completion of the first space elevator there will be more people living and working in outer space than on earth. The first space elevator is difficult to build.The second is much easier.The third, easier still etc.,until we have a ring of elevators around the planet.A trip to space will be as cheap as a train trip across the country.Colonizing the Moon and Mars will be affordable.Space tourism will be huge.Asteroid mining will be huge.And all of these industries will require lodging and related supply chain infrastructure for space side construction workers. A new space elevator concept will help to make us a true space faring civilization . an earth based space elevator. Let’s get started. A new collection of essays curated by environmentalist James Lovelock aims to help people better understand the earth. How might Donald Trump influence climate change policy, and where can we look to for innovative environmental solutions?